Supernumerary teeth are extra permanent or deciduous teeth which form in either jaw. Depending upon which study you reference, they occur in .3 to 3.8% of the population. 90% of all occurrences are found in the maxilla (upper jaw). In some cases, supernumerary teeth cause no problems for the patient and do not require extraction. But some do ultimately present problems and end up requiring removal. For these teeth which occur in the maxilla, nearly all occur either at the midline or in the wisdom tooth area. When present at the midline, they are referred to as a mesiodens. Supernumerary lower wisdom teeth. Panoramic x-ray taken by Dr. Nicholas Calcaterra. This male patient was from Ansonia, CT. Clicking on image yields a large copy. The above x-ray shows the unusual presentation of two supernumerary lower wisdom teeth. They are circled in red. This patient, who came to our office from Ansonia, CT, had 6 wisdom teeth. All 6 required removal because the lower wisdom teeth were causing pain and the patient was experiencing recurrent gum infections. Extra lower premolar on a patient from Orange. The tooth was extracted by Dr. Nicholas Calcaterra. Photo Dr. Calcaterra. The above patient had an extra lower premolar – a fairly uncommon finding. 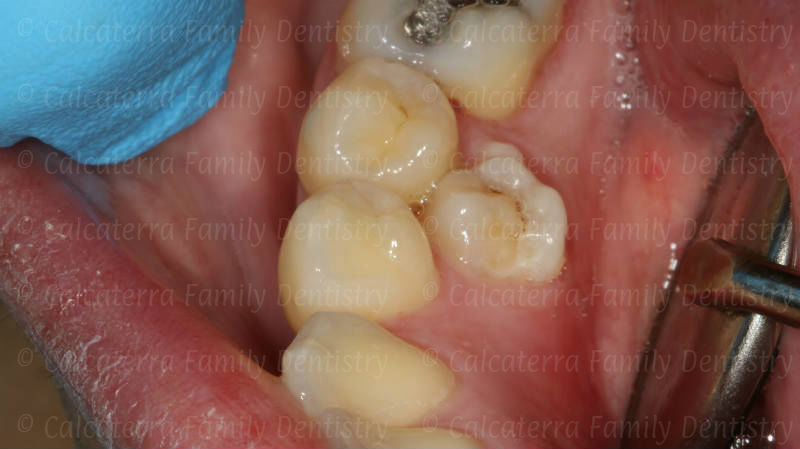 It required extraction because this tooth and one of the adjacent ones was developing decay. This female patient was from Woodbridge, CT. She had 3 supernumerary wisdom teeth. Panoramic x-ray taken by Dr. Nicholas Calcaterra. In the above case we can see a total of 7 wisdom teeth. 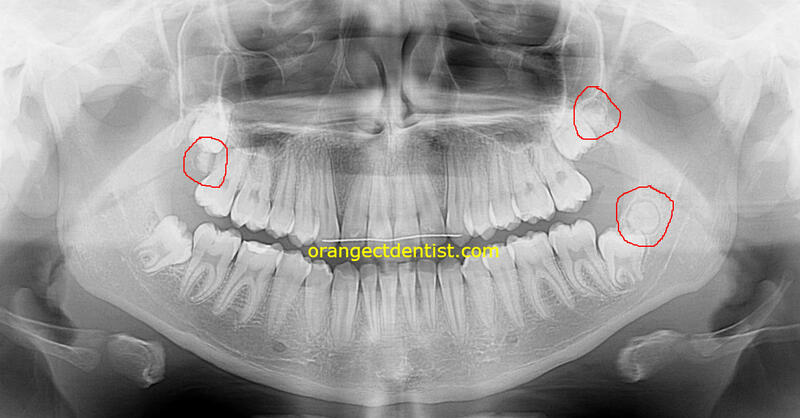 We have 2 supernumerary wisdom teeth on top and one on the lower left. The patient had all 7 teeth removed. One study found that supernumerary teeth occurred eight times more often in the Maxilla (upper jaw) than the mandible (lower jaw). The same study showed that the extra teeth occured twice as frequently in men than in women. Another study of 50 patients from 16 months to 17 years of age found 20% of the supernumerary teeth to be inverted. Of those, 14% of these patients had multiple supernumerary teeth, and eighty percent of the extra teeth were closer to the tongue side of the jaw than the cheek side of the jaw. All of these teeth can vary considerably in size and shape. All clinical examples are from the dental practice of Drs. Nicholas and Carla Calcaterra. Study data from: Scheid, Rickne C.. Dental Anatomy: Its Relevance to Dentistry, 8th Edition. Lippincott Williams & Wilkins, 2011.